With summer knocking on the door, the time has come to get your air conditioner running again. But before you do so, it’s a good idea to spend some time getting the air conditioner unit up and ready. In fact, keeping a schedule for your AC unit’s maintenance is probably one of the most rewarding household chores. Regular air conditioning maintenance pays off in two ways. While your AC runs smooth and keeps you cool without breaking down, it also saves you money on energy bills. That’s because when an AC is put through regular maintenance, its efficiency is kept high and in turn, it uses lesser energy. In keeping with that, here are five air conditioner maintenance tips that you can perform on your own. Regular maintenance of air conditioners increases their life by the order of a few years. When you combine that with the lowering of energy costs and an increase in reliability, it becomes apparent why regular maintenance of air conditioners is so important. A few of the tasks outlined below can be performed by homeowners on their own. 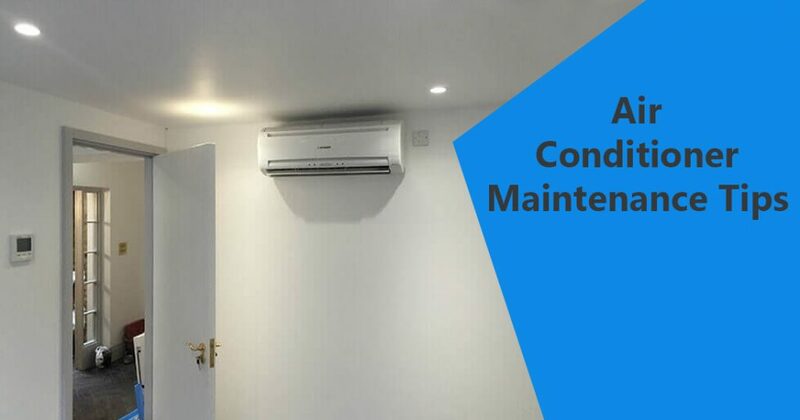 However, if you feel uncomfortable with a task at any point, do not shy away from calling a professional air conditioner maintenance service. If you do take these tasks up, follow all safety precautions like wearing safety equipment and shutting down power supply to the unit beforehand. One of the most important AC maintenance tasks is to keep the air filter clean or replace it when necessary. You can clean the filter if your AC comes with the reusable kind and if not, just replace it altogether. The frequency with which you need to do this depends upon where you live. ACs in urban areas would need their air filter cleaned/replaced more frequently than their semi-urban or rural counterparts. Generally, once a month during summers and winters and once in two months during fall and spring sounds about right. Why is it so important to clean/replace the air filter? For starters, if it becomes clogged with dirt, dust and allergens, the air flow decreases. This makes your AC work harder than what’s required. The clogged filter might also pass on the dirt, dust and allergens to the air that you breathe, thus putting you and your family at the risk of developing asthma and allergies. Before you perform this step, make sure to cut power supply to the air conditioner. Now remove your condensing unit’s access panel and check if there are any melted insulations or burned and broken wires. Locate the contactor switch and see if it shows too much pitting. If so, replace it. Also, check for any loose electrical connections throughout. As mentioned previously, some of these tips can be too much to handle for first-timers. So if you find yourself lost with something, get an air conditioning professional to do it. One of the most important items in any air conditioner maintenance checklist, the thermostat is used to maintain an ideal temperature in your home. In case you are using an old-style mechanical thermostat, know that investing in a programmable thermostat is absolutely worth it. For instance, you can program it to turn up the temperature when no one’s home and bring it down to a desired level around half an hour before you return home. This way, you’ll come back to a comfortable setting and save the energy that would have otherwise gone into running your AC the entire day. The fan of the condenser unit is very important for its proper functioning. To check if it’s working properly, turn off the power to your wall mounted air conditioner and examine the fan’s blades for any signs of chips or cracks. If you spot any problems, replace the fan immediately. Owners of older air conditioners might further need to oil the unit’s fan motor bearings for smoother operation. Since a part of your air conditioner is left exposed to outside elements, it tends to accumulate a lot of debris like dirt, leaves, dead insects and even grass clippings. If not paid attention to, this build-up can reduce the air conditioner’s capacity and decrease the air flow. Cleaning the unit is quite straightforward. Once you shut the AC’s power supply, use a garden hose to remove the debris and other build-up. However, avoid using a powerful hose as it can damage certain delicate parts of the air conditioner. The surest way to avoid air conditioning repairs is to maintain it regularly. Not only does routine maintenance keep the AC running without skipping a beat, but it also saves you a lot of energy and money.